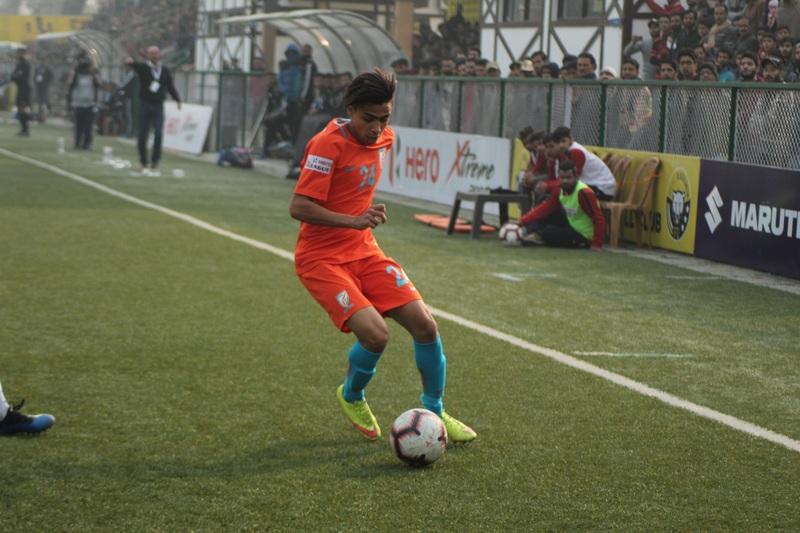 New Delhi, November 30, 2018: If starring in the AFC U-16 Championship in Malaysia, where he scored India’s only goal in the tournament against Vietnam in a 1-0 win was not enough for 16-year-old Vikram Partap Singh, the forward has quickly shuffled his aim and targets glory with the Indian Arrows – AIFF’s development side in the Hero I-League. How different is playing in the Hero I-League as compared to youth level tournaments? In comparison to the youth level tournaments, playing in the Hero I-League is like playing in a different universe altogether. The amount of dexterity, tactical knowledge and skill that one needs to possess in a game in Hero I-League is extremely high. However, there is also a lot of physical play involved in the Hero I-League as it is a part of football. You don’t get that much in youth level tournament and hence, it is an eye-opener for me. How challenging is it to adapt to physical play? You must know how to shield the ball and protect the ball from tackles at all times. Sometimes uncanniness can result in you being dispossessed. It is quite challenging as one has to be aware all the time and a lapse even for a split second can give the opponent the chance to outmuscle you and steal possession. So far, we have tried to adapt with it and are gradually learning how to use our bodies cleverly — in terms of securing possession and making small seconds count by putting our bodies on the line. Have you set any personal goals for the Hero I-League? My only goal is to play with more than my hundred percent in every match that I start in. I know the gravity of the platform that the Hero I-League has given me and I just want to make the most out of it. How has the FIFA U-17 World Cup batch helped you in mixing with the Arrows squad? I already knew a lot of players from the FIFA U-17 World Cup Team and have reunited with them in the Indian Arrows. The transition from the Indian U-16s to Arrows was almost seamless and I am enjoying every moment of the day with them. The Indian Arrows are currently last in the table. How do you assess the performance and what can we expect in the games about to come? It is still early days in the season and we have shown the quality we possess in all matches that we have played. We gave teams like Mohun Bagan and Real Kashmir a run for their money. In the games to come, we need to be more clinical in front of rival goal and try to make the most out of the situations that come our way.